Wexford Chamber President Niall Reck, publishing entrepreneur and former Dragon on Dragon’s Den Norah Casey and Wexford Chamber Skillnet Network Manager Claire O'Rourke at the recent business lunch in the Ferrycarrig Hotel, Wexford. Almost 100 people attended the recent business networking event featuring broadcaster, publishing entrepreneur and former Dragon on Dragon’s Den Norah Casey, in the Ferrycarrig Hotel, Wexford. Many attendees were women involved in various businesses around the county. The event was hosted by Wexford Chamber and was sponsored by Wexford Chamber Skillnet, Danone Nutricia and the Wexford People. Opening the proceedings, Chamber President Niall Reck welcomed Ms Casey to the sunny south-east, complimenting her extensive CV of entrepreneurship and innovation. Ms Casey’s discussion was entitled ‘The Power of You – The Importance of Navigating Your Own Life’, and she spoke of how she had spent her whole life studying strategy. She said that ‘this generation was constantly trying to recreate things as if everything had been invented and the innovative side of people’s brain was lazy’. To that end, she recommended a book called ‘Blue Ocean Thinking’, saying it was something that she encouraged her own son to read. ‘Bring your 12-year-old into your business, they will imagine things better than any adult‘, she remarked, adding that ‘most businesses operated in red oceans, bloodbaths between similar businesses instead of embracing innovation. When it came to women in business, she believes that ‘confidence, rather than competence was holding women back. She said women were better at calculating risk which was why, she pointed out, that most women in CEO roles had come via the finance route’. 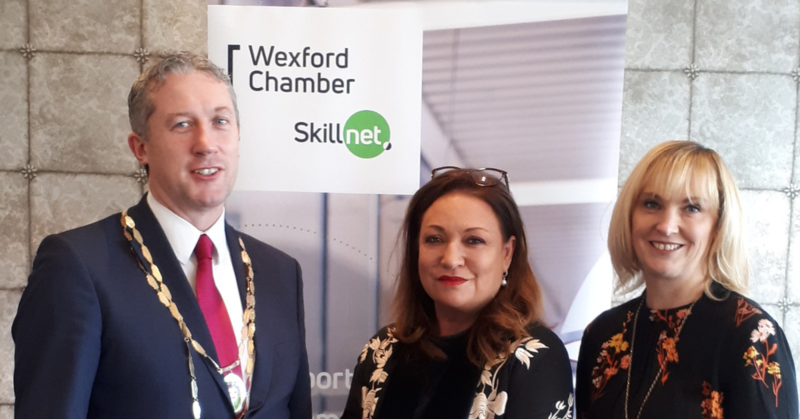 Claire O’Rourke, Network Manager of the Wexford Chamber Skillnet observed ‘The event was a huge success with everyone feeling revived and uplifted after a very impressive presentation from Norah Casey. We look forward to supporting inspiring events such as this in the future, and continuing to provide innovative training and upskilling to businesses across the county’. The above is a summary of an article written by Wexford People’s Anna Hayes, read the full article on Wexford Chamber website. If you would like to learn more about upcoming Wexford Chamber Skillnet events and training courses visit their website or contact claireorourke@wexfordchamber.ie. Wexford Chamber Skillnet is co-funded by Skillnet Ireland and member companies. Skillnet Ireland is funded from the National Training Fund through the Department of Education and Skills.